From adobe to straw bales, traditional building materials are being adapted to meet code-required standards for health and safety in contemporary buildings around the world. Not only are they cost effective and environmentally friendly, but, when used correctly, these natural alternatives match the strength and durability of many mainstream construction materials. 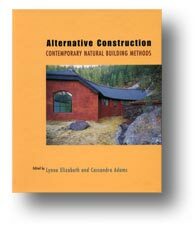 This guide to combining traditional natural materials and modern construction methods examines a broad range of traditional and modern natural construction methods, including straw-bale, light-clay, cob, adobe, rammed earth and pisé, earthbag, earth-sheltered, bamboo and hybrid systems. It also covers key ecological design principles, as well as current engineering and building code requirements. Experts on each building system have contributed core chapters that explore the history, development, climatic appropriateness, environmental benefits, performance characteristics, construction techniques and structural design principles for each method. More than 200 visuals depict both construction processes and completed structures. An extensive resource guide shows where to go for further information, training and research. In an increasingly resource-conscious era, alternative construction is truly an idea whose time has come. Whether you’re an architect, designer, student, or homeowner, this book will help you to combine indigenous building materials with modern construction systems and design standards to create low-impact, high-quality buildings that meet the highest levels of comfort, health and safety.